Germany's opposition Left party drew a Defense Ministry admission Wednesday that only 39 percent of large items delivered to the German armed forces in 2017 did not require further improvement before deployment. The quality of items delivered was "still improvable," said Parliamentary State Secretary Peter Tauber, who until February was general-secretary of Chancellor Angela Merkel's conservative Christian Democratic (CDU) party. The admission, which came in response to an inquiry from Left parliamentarian Matthias Höhn, coincides with German troop involvement in a major NATO exercise in Norway and follows calls for improved readiness from defense officials, including Defense Minister Ursula von der Leyen. 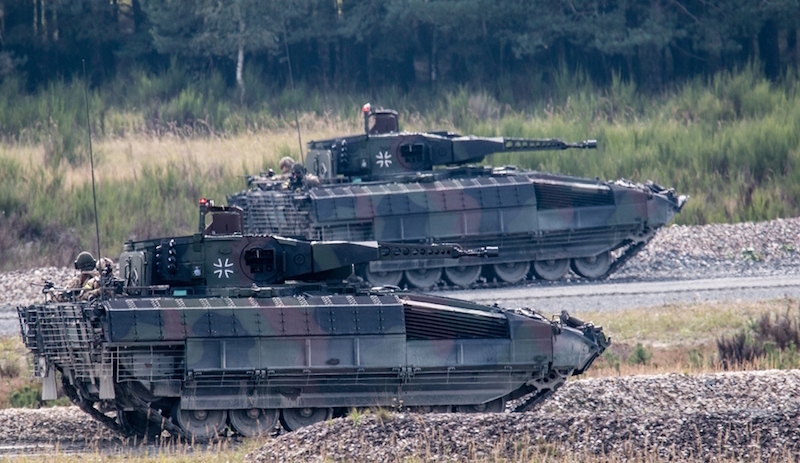 Tauber's reply, cited by the German DPA news agency, said the Bundeswehr strove to have 70 percent of its weapons systems ready for operations at any time. In 2017, only 39 percent of new deliveries were ready for deployment. "As before, we see industry obligated to fulfill the agreed specifications as soon as possible," said Tauber. Especially worrisome were Airbus A400M military transport aircraft and the Puma infantry tank delivered since 2010 by a German consortium comprising Krauss-Maffei Wegmann (KMW) and Rheinmetall Defence. Airbus describes its A400M as "the most advanced, proven and certified airlifter available, combining 21st century, state-of-the-art technologies to fulfill the current and upcoming Armed Forces' needs." The armored vehicle consortium said the Puma provides its crew with "protection technologies of the latest generation." Only 27 of the 71 Pumas delivered last year; half of the eight A400M delivered; two among seven Tiger combat helicopters; and four among seven NH90 transport helicopters, were operationally ready last year, reported DPA. Among four new Eurofighter combat jets delivered in 2017, one could be used. The other three were being fitted with new main computers. "Clearance for the use of these three Eurofighter is expected shortly," said Tauber in the ministerial reply. Höhn said it was a scandal that von der Leyen "tolerates this arms industry' slovenliness at the cost of taxpayers." In a letter to parliamentarians last June, urging them to boost Germany's defense spending, von der Leyen wrote that declines in the defense budget since the end of the Cold War had resulted in reductions in maintenance and cuts along supply lines for replacement parts.